A girl lost in thought on a bus ride in the night – Ruler. Unusually summoned through the union of her spirit and a French girl, she feels something is amiss in the war to come. To fulfill her role as Ruler over this war, she departs for Trifas. A homunculus boy awakens in his incubation tank. Assaulted with visions of the fate of his comrades, he manages to escape confinement. Unfortunately, he lacks the strength to make it to the outside world and is instead found collapsed on the ground by Rider of Black. A rampaging Berserker of Red is rapidly approaching the Yggdmillennia citadel, prompting them to respond. Meanwhile, the homunculus boy ponders the meaning of his existence and the conversation he had with Archer of Black. Saber of Black devotes his heart to the boy who desired freedom. In his last moments, Ruler promises that she will grant the boy that freedom and insure that Saber’s wish will come true. Fiore Yggdmillenia, who was also visiting Sighișoara to contact the master of Assassin of Black, unfortunately runs into Kairi Sisigou and is engaged in battle. Assassin of Red’s Noble Phantasm, the Hanging Gardens of Babylon, is activated as the Red faction prepares its all-out assault on the Black faction’s citadel. The Great Holy Grail War enters a new violent phase while Ruler and Sieg make their way to the battlefield. Sieg comes to the rescue of Rider of Black and confronts Saber of Red. Berserker of Black also arrives and attacks, while her master Caules Yggdmillenia struggles with the choices he has in the form of the Command Spells. Saber of Black responds to Siegs willingness to fight, the battle between Lancer of Red and Lancer of Black heats up considerably, and Darnic comes to a decision regarding his plan. In the Hanging Gardens, Shirou lays bare his wish for the Holy Grail, while on the ground Rider of Black is forced to act against his own by his master Celenike Yggdmillennia. Sieg works with the other homunculus to patch up the wounded when a very angry Ruler appears. Meanwhile, the remaining Yggdmillennia masters discuss what to do following Caster of Blacks betrayal. New allies and old enemies reform their ranks as the change of ownership of the Greater Grail leaves various parties reminiscing on their past and the road taken. Assassin of Black moves closer to Trifas on their killing spree, forcing the remaining members of the Yggdmillenia clan to act against them. Ruler takes Sieg out on a date in Trifas under the guise of luring out Assassin of Black but ends up enjoying this reverie more than she expected. With her Command Spells, the master of Assassin of Black unleashes a vision of Hell within the mist. To those caught in it, the tormenting trap is all but inescapable. The Hanging Gardens of Babylon are quickly leaving Romania, forcing the remaining Yggdmillennia masters, Ruler and Kairi Sisigou to formulate the best plan of action to intercept the flying fortress. 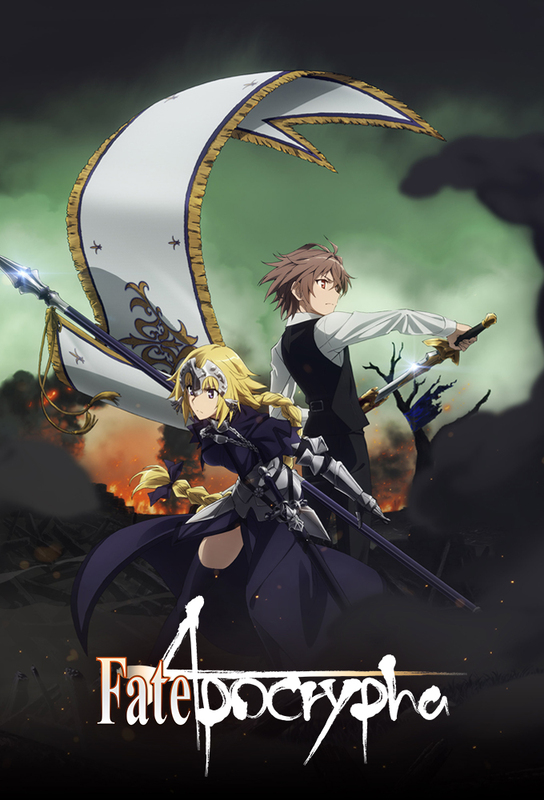 The masters and servants of the reformed Black Faction renew their convictions as they head out for what they plan to be the last battle of the Great Holy Grail War. The Great Holy Grail War resumes in midair on the Black factions approach of the Hanging Gardens, with the servants of Red choosing their opponents to fulfill promises or curses made on the battlefield. The battle between fated adversaries intensifies, with Ruler facing off against Archer of Red and Saber of Black appearing in front of Lancer of Red. Saber of Red confronts Assassin of Red and Ruler struggles with Caster of Reds machinations. Shirou reaches the Great Holy Grail and states his wish while Ruler, supported by friends old and new, activates her Noble Phantasm. A boy once stood opposed to Shirous wish, wielding a sword to fulfill his own. Thus the wishes intertwined into Apocrypha.